Let the storm rage. Let the winds come and the torrents fall. 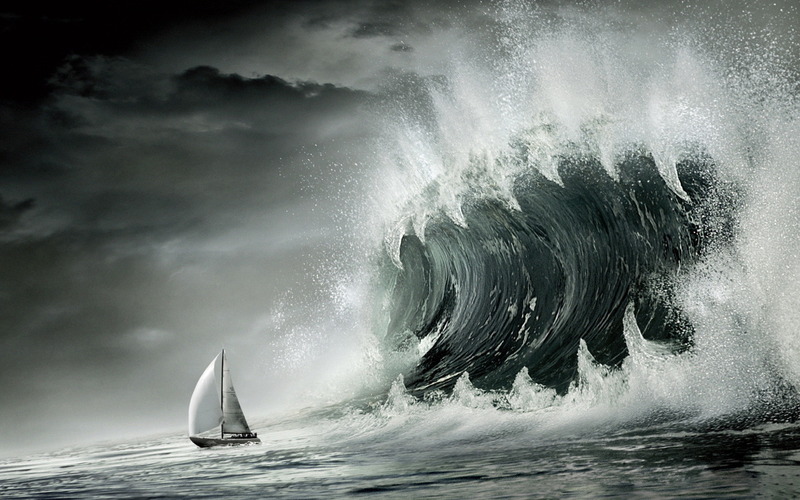 No matter how the boat rocks and pitches, remember – the storm is only on the surface. Deep down below, all is still, and quiet, and calm. What’s there to be afraid of? I am with you, and I can calm the storm at will. If I allow the storm to carry on, it is because you are safe with me. Even if you drown, what’s there to be afraid of? Your soul is safe with me. Your life belongs to me. Nothing can touch you without my allowing it. beyond what you were before. Yes, don’t be afraid of distracting and negative thoughts and feelings, no matter how powerful they are. They’re just the storm on the surface. You have given your heart and soul to God willingly. He keeps you safe. He allows you to be tempted so that you might grow stronger. Reject temptations calmly – there is no need to be afraid. The victory is won. The victor is Christ. And Christ lives in you. This is a great picture. We would like to ask you if you let us use it in TEDx poster? Please, let me know ASAP. Hello, my name is Alina Lapina. We are organizing TEDx event in Klaipeda, Lithuania. Our topic is the Ocean of Courage, and the picture that you used for this post is incredibly awesome for the main poster of the event. Could I ask you if it is possible for us to take it for the honor of being the representation of our event?